Storage hardware giant Seagate has successfully used tiny lasers to increase the capacity of a traditional 3.5-inch hard drive to 16TB. The technology, known as Heat-Assisted Magnetic Recording (HAMR), employs a radically new read/write head design and a specific magnetic alloy to reduce the width of data tracks – helping store more information in the same amount of physical space. 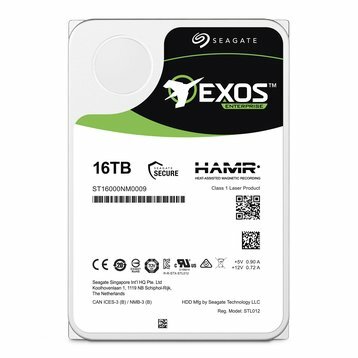 Seagate has built and tested the first generation of HAMR drives, and said it will sell them as part of its Exos product family – aimed primarily at enterprise customers – however the exact date of the commercial launch has not been made public. The highest capacity HDD on the market today is Western Digital’s Ultrastar DC HC620, weighing in at 15TB – but it uses Shingle Magnetic Recording (SMR), a method of storing information that boosts capacity at the expense of write speed and requires customers to modify their applications and/or operating system. HAMR relies on a very small laser diode mounted on the drive’s read/write head that heats up the storage medium – a spinning disk made of “a new kind of media magnetic technology” - before any information is written. This allows the use of smaller magnetic grains and narrower data tracks, and results in higher areal density – which enables more data capacity. Unlike SMR drives, HAMR drives can be used as a drop-in replacement for existing Perpendicular Magnetic Recording (PMR) drives – the traditional HDDs widely used in the server industry. The HAMR technology was proposed by Fujitsu way back in 2006, and demonstrated by Seagate in 2012, but bringing it to the market has proved complicated: Seagate originally planned to launch working drives by 2015-2016, but even after the latest set of tests, it refuses to commit to a specific launch date. The company does say, however, that HAMR technology will enable it to build 20TB+ hard drives by 2020. “Our testing has demonstrated the drives’ compatibility for enterprise systems that are being used today. No system level changes are needed to run the HAMR drives in these evaluations, or to deploy them in customer environments,” said Jason Feist, Seagate’s senior director of enterprise product line management.